I was talking to a fellow boater the other day. 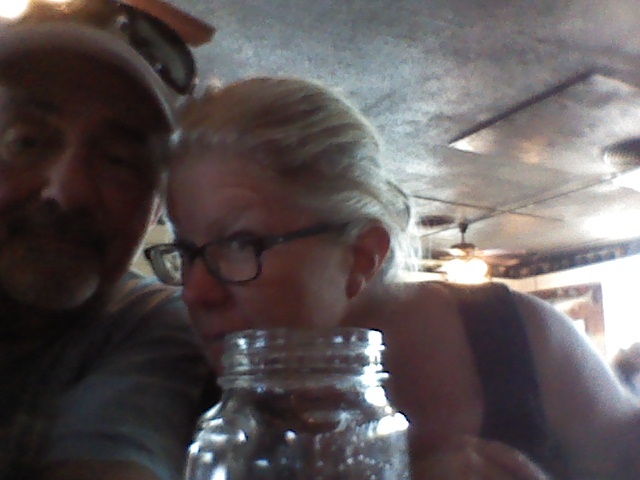 I told him my wife and I took off for a year to do the Great Loop and explore the eastern half of the United States. 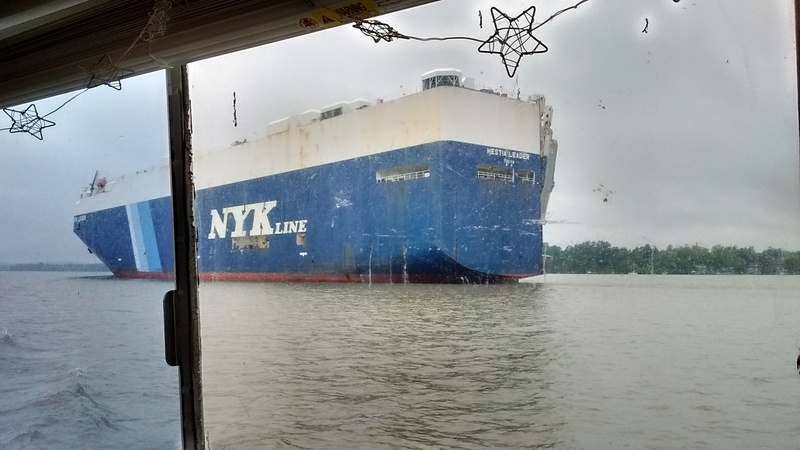 Hampton, VA. Our first port in the Chesapeake. 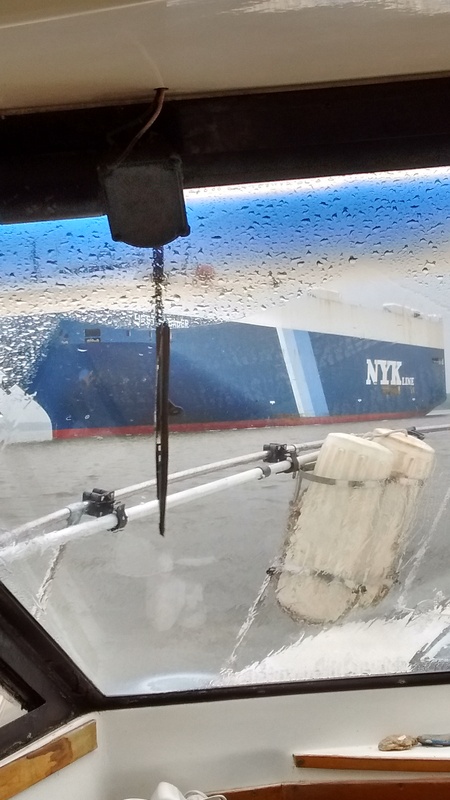 Yorktown, VA. Free giant mooring balls to tie up to. 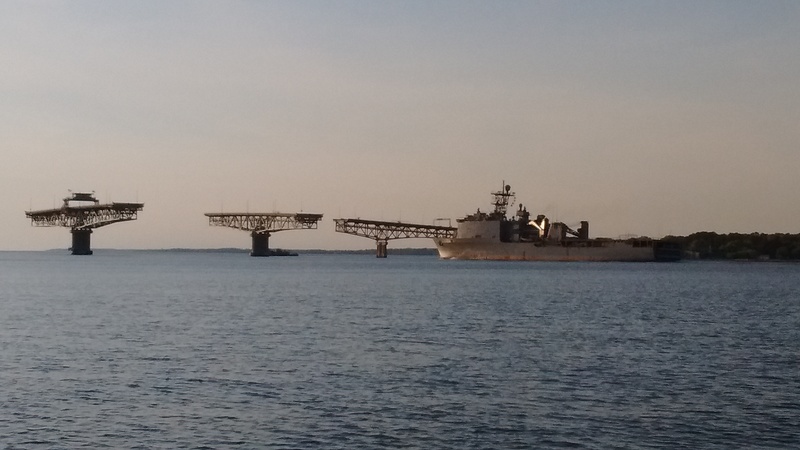 In Yorktown, a ship goes through the largest swing bridge. Two sections swing at the same time. 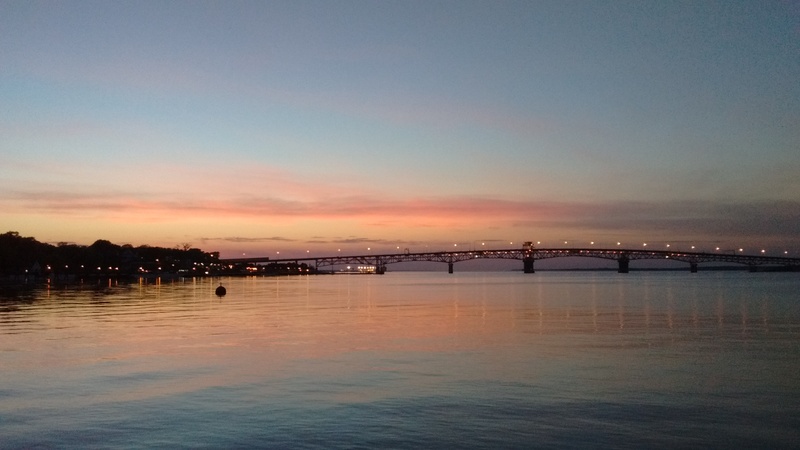 The same bridge at twilight. Horne Harbor. 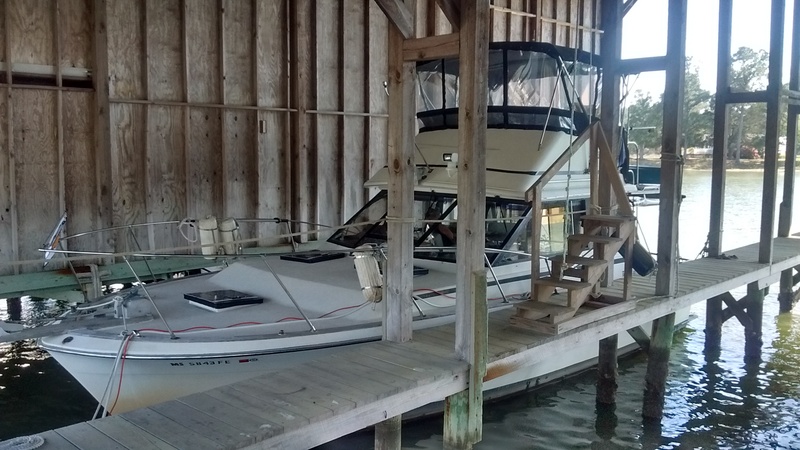 Docked in a covered slip. 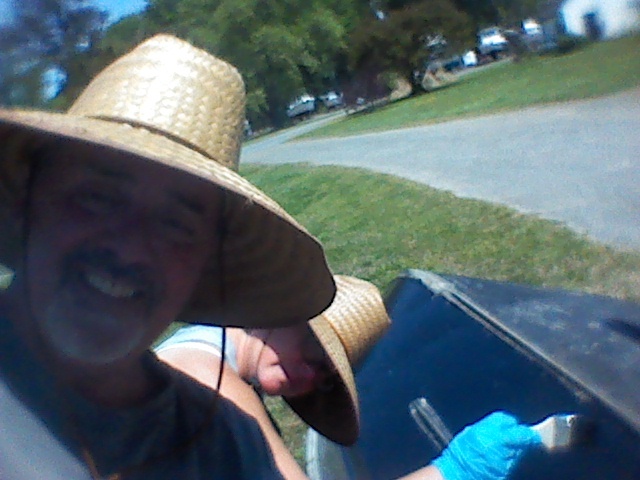 Painting Salty’s bottom at Horn Harbor VA.
I’m supervising the paint job. It’s going very well. 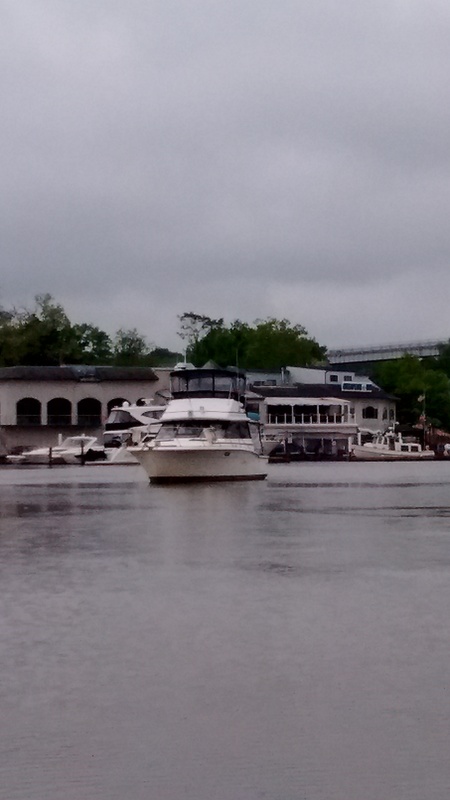 Docked at Parks Marina in eclectic Tangiers, VA. 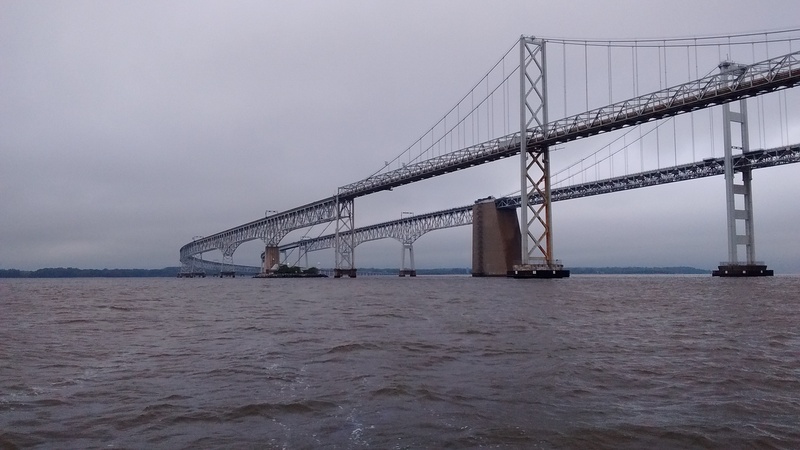 The XO pilots Ginger Lee through Virginia into Maryland. And looks good doing it. 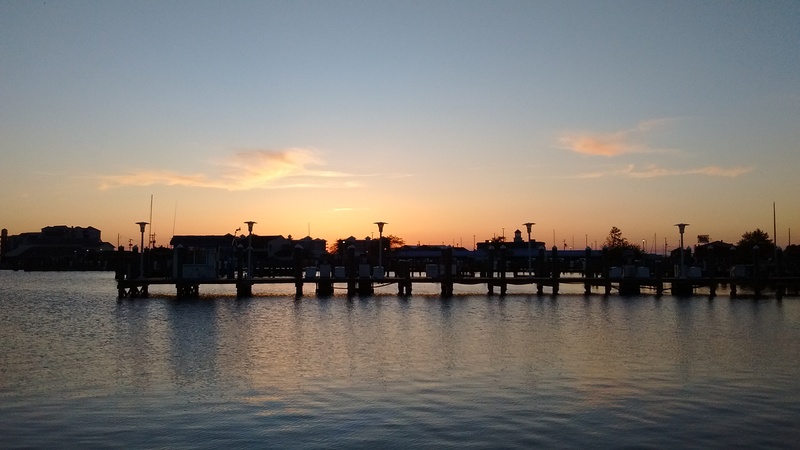 Sunset at Sommers Cove Marina, MD. 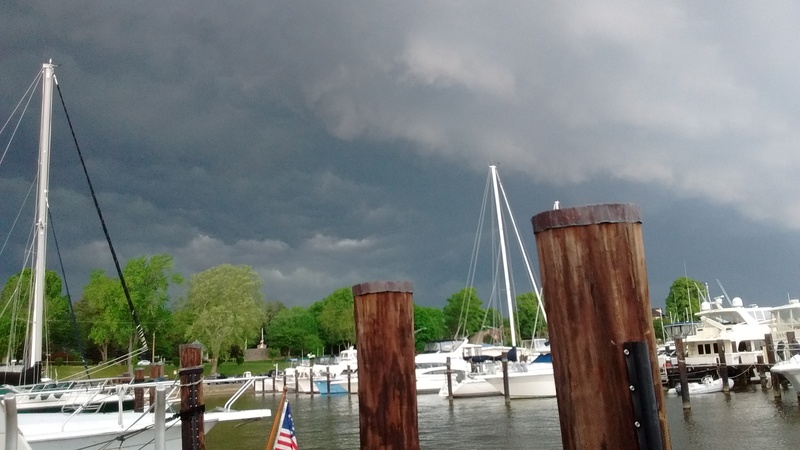 Sommers Cove Marina, MD. 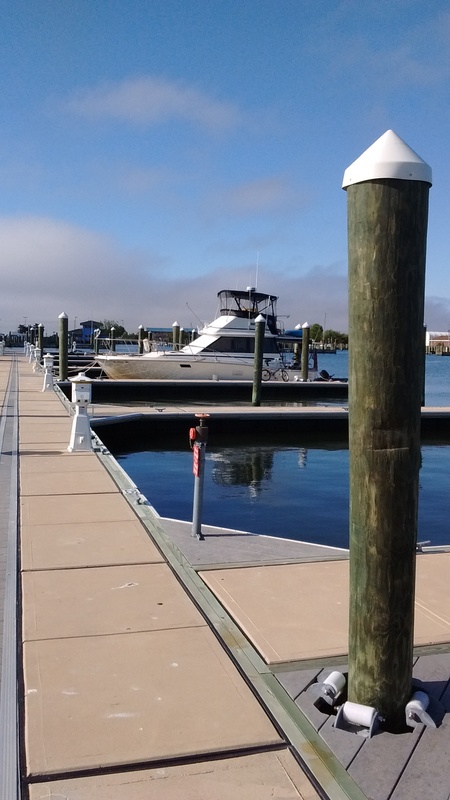 The day before, this dock was full of loopers. We were the last to leave. 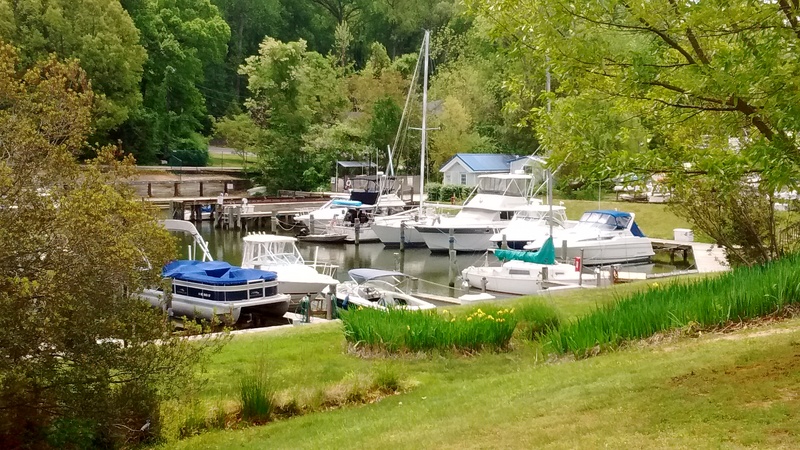 Idyllic Flag Harbor Yacht Haven in Maryland. One of the most protected harbors I’ve ever seen. Under way. 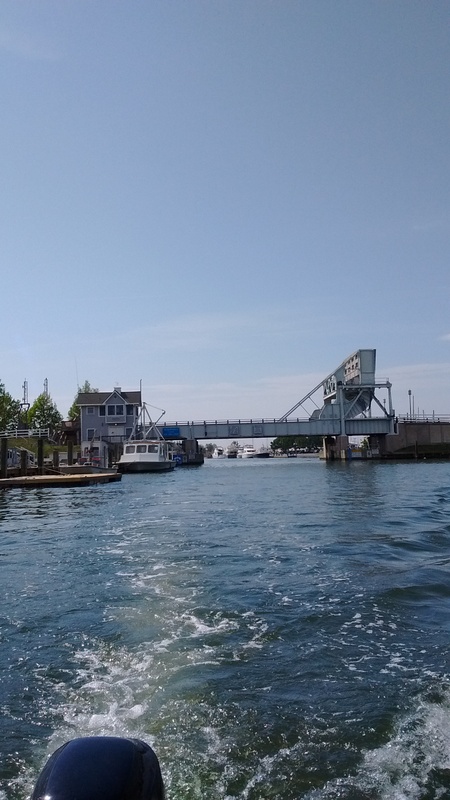 Leaving Flag Harbor. I could live there. Hated to go. 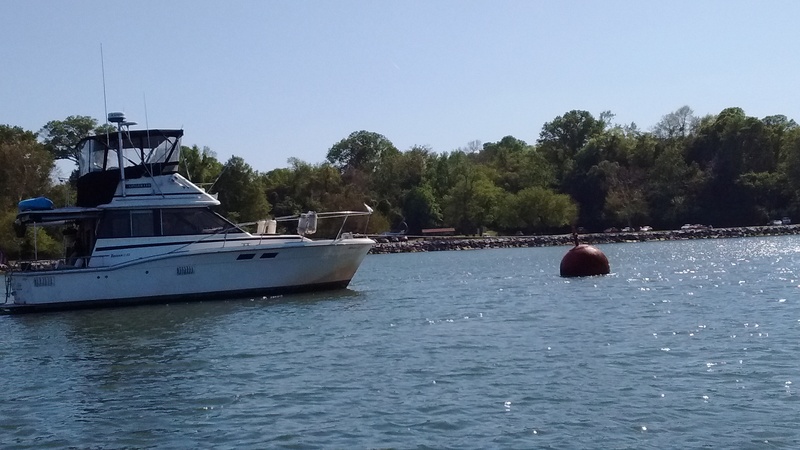 Docked in Knapps Narrows, Tilghman’s Island, MD. 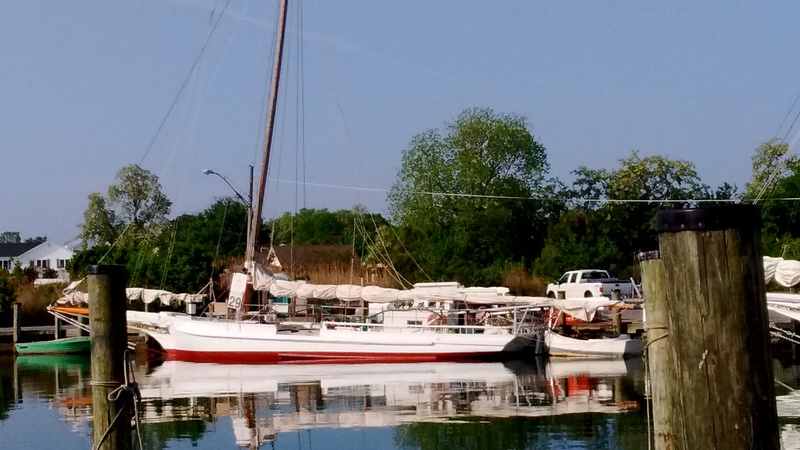 This beautiful sailboat happens to be Hinkley’s fiberglass hull number one. 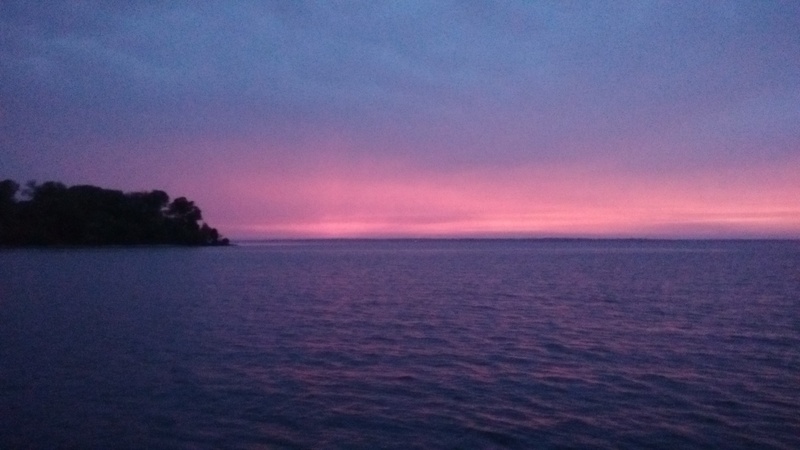 A Chesapeake Deadrise. 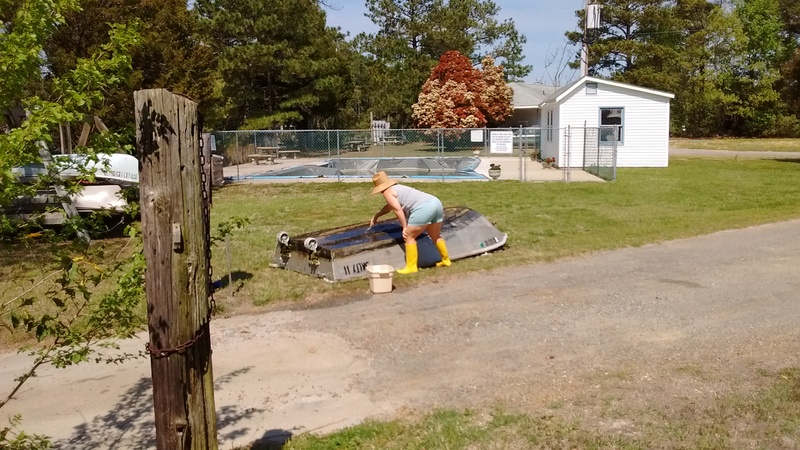 The most common working boat around here. 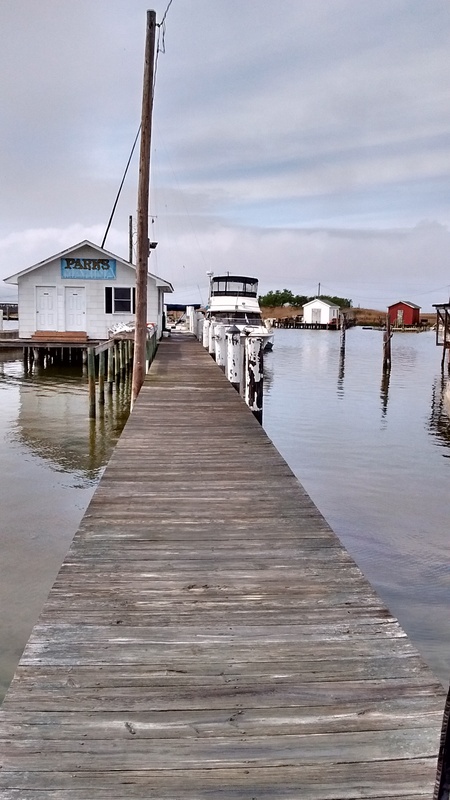 Another example of a Chesapeake Deadrise. 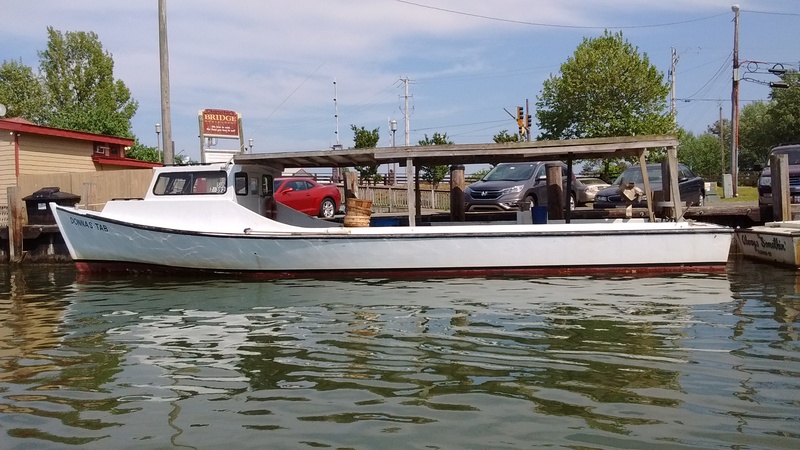 They’re like the pick-up trucks of the watermen. 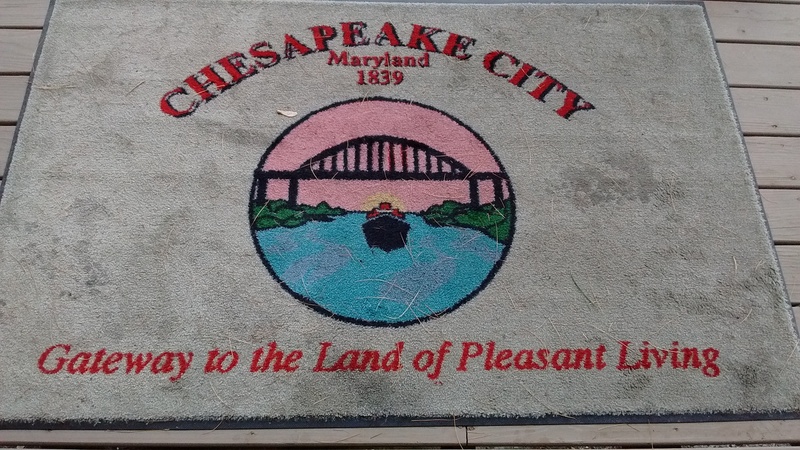 I’ve never seen them anywhere else but the Chesapeake. 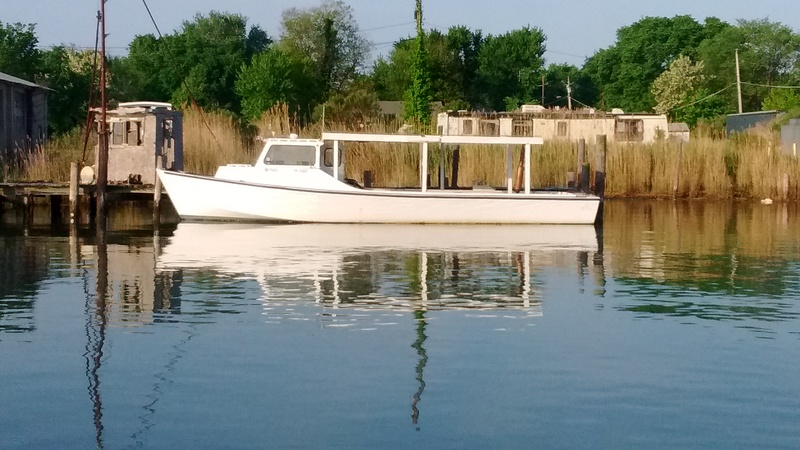 A skipjack working boat and its pusher. 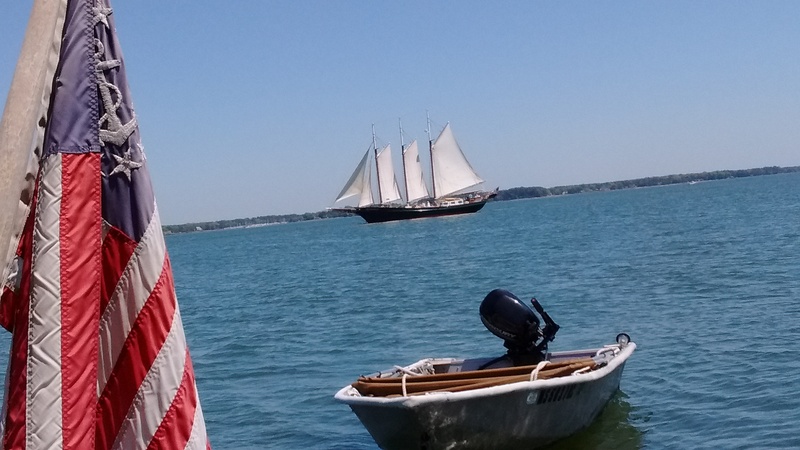 These historic sailing vessels are unique to the Chesapeake. This is one of several in Tilghman that is still in use. 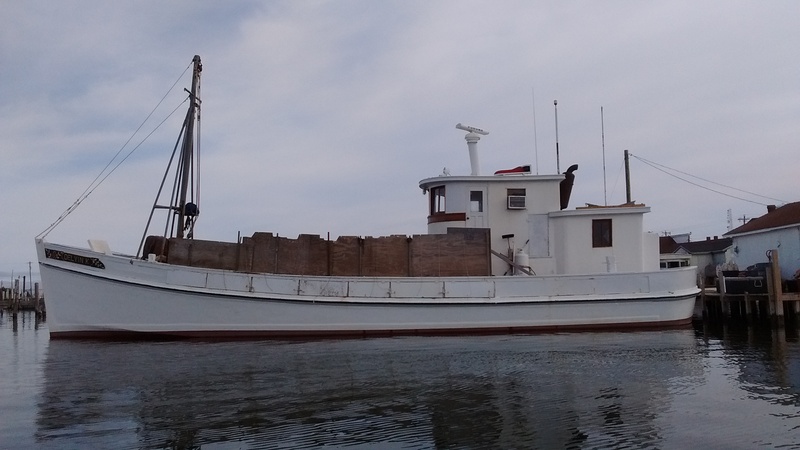 Close-up of a skipjack pusher. 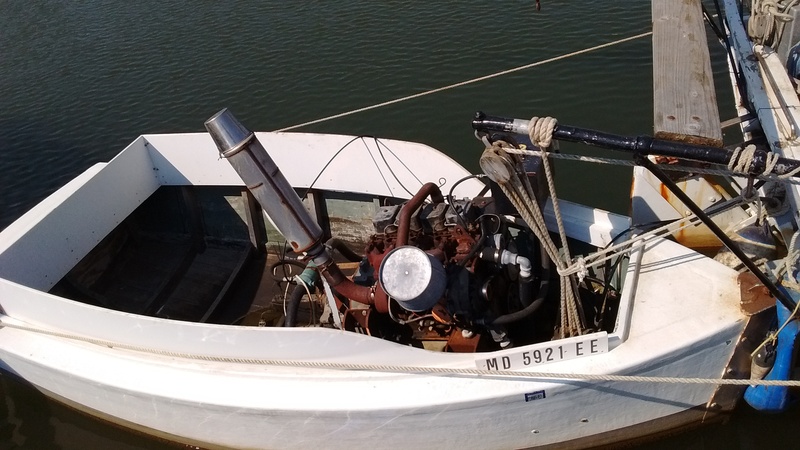 Basically, it’s a large diesel engine in a tiny dory specifically designed to push the skipjack. I want one to bomb around in. 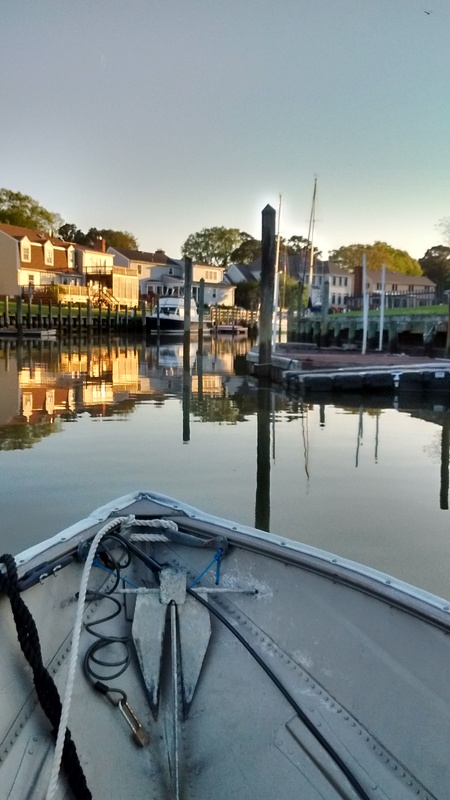 On a Tilghman’s Island dinghy ride. 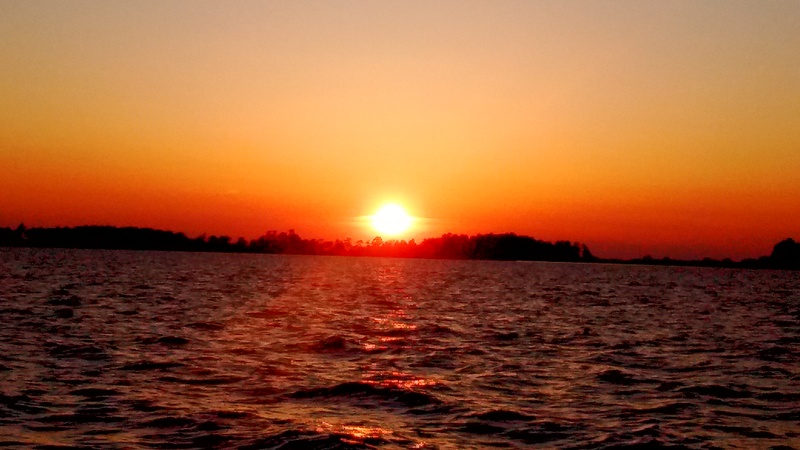 Chesapeake Bay scene. This bridge crosses it. 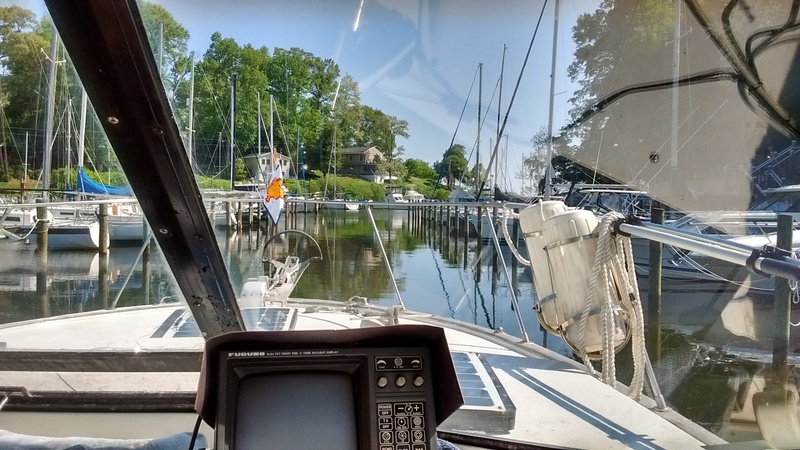 Anchored in Still Pond Creek, MD. 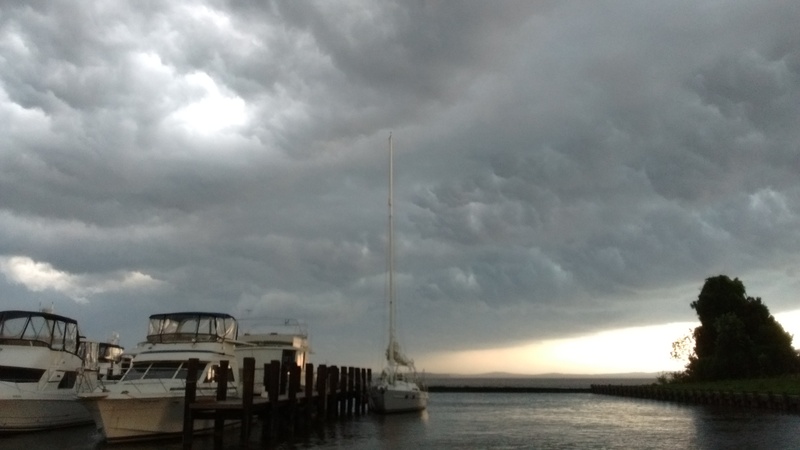 Watching a storm approach at the Havre de Grace Yacht Basin in Maryland. 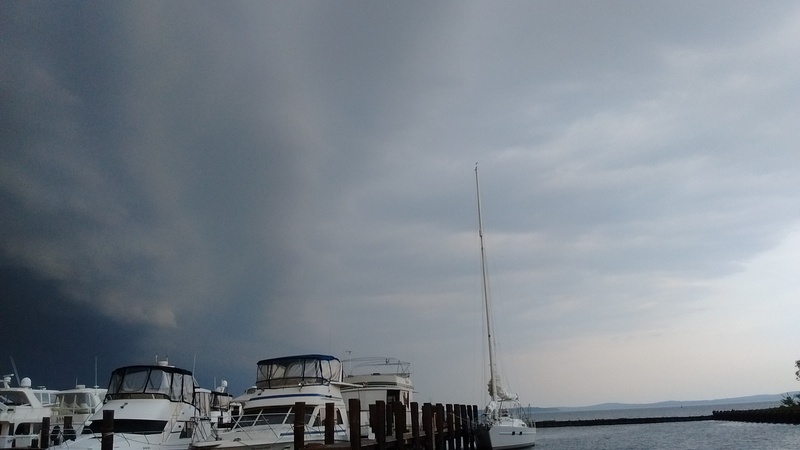 Storm a comin’! About now we are securing the hatches and everything else. Looks ugly. Rained like hell. Thunder and Lightning too. Glad we were tied to a dock. 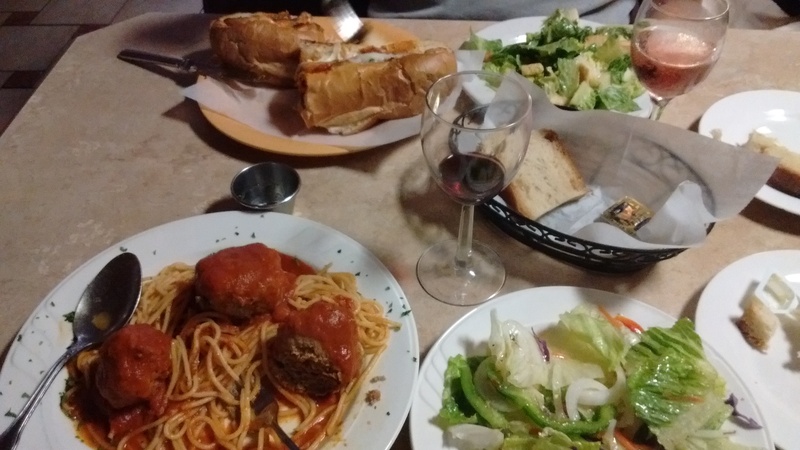 A real Italian Restaurant in Havre de Grace, MD. On the way to Chesapeake City, MD. this huge car transport hailed us on the radio and asked us to give them the whole channel. We gladly complied. This picture made the weather look worse than it was. 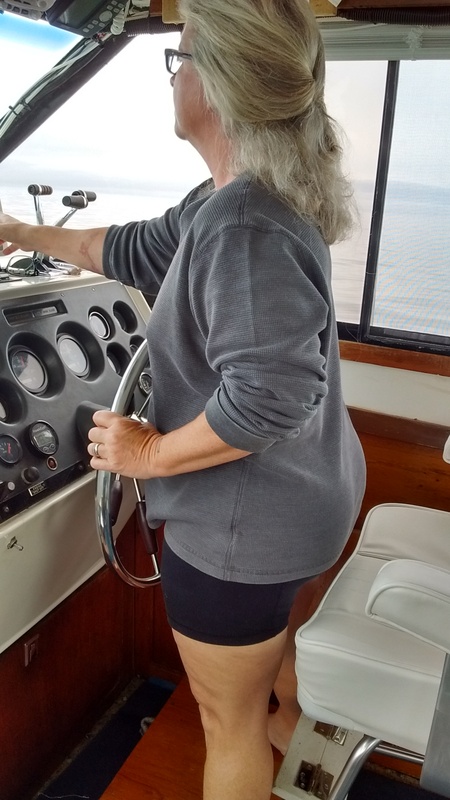 It was a little rainy but the seas were flat. He needed the whole channel! 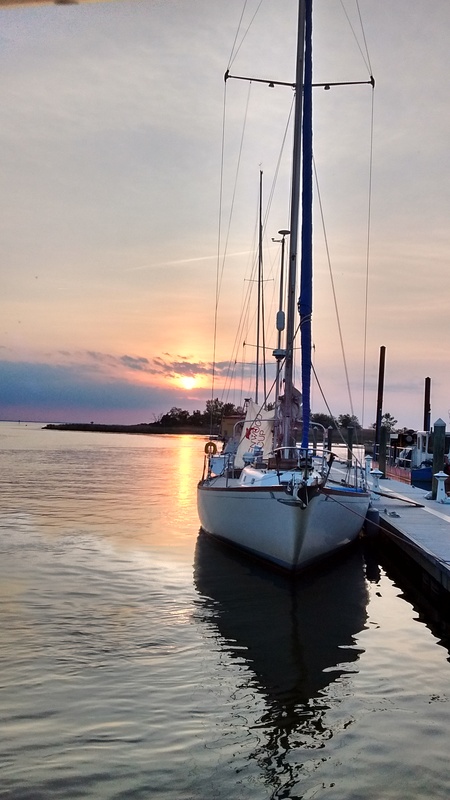 Anchored in Chesapeake City, MD. on a rainy day. 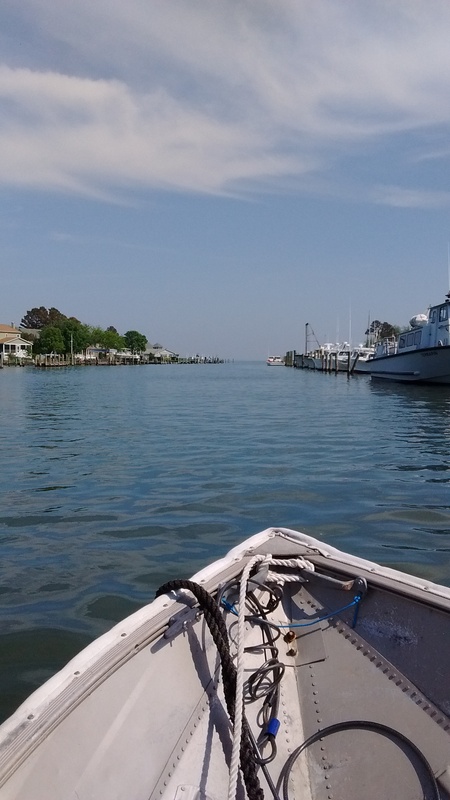 It is our last port on the awesome Chesapeake. Interesting rug at city hall.